It's a Starry Christmas at Discovery Shores Boracay with sparkling kiddie activities, sumptuous holiday feasts and blissful spa treatments. The most awaited time of the year is just around the corner. What better way to spend the holidays than to enjoy the company of family and friends. This year, celebrate this festive occasion by the beach and create unforgettable memories. Visit Boracay, Conde Nast Traveler Magazine's Best Island in the World for 2016. In Boracay, choose to stay at the best resort in Station 1, Discovery Shores Boracay. This year, the luxury resort celebrates "A Starry Christmas" offering guests sparkling Yuletide activities perfect for a memorable beach holiday. The little ones will have a grand time with daily holiday activities at The Sandbox at 4pm beginning 21 to 24 December 2016. Kids will enjoy singing Christmas carols and will have the chance to decorate their own mini Christmas trees, holiday wreaths and Yuletide greeting cards. On 23 to 24 December at the Discovery lounge at 4pm, Santa Claus hits the beach to spread holiday cheer to everyone. To cap off the wonderful kiddie experience, on 25 December at 4pm, a sparkling afternoon party awaits the little bosses at the beachfront. Delightful holiday banquets are in store to make the festivities merrier. On 24 December at 7pm, enjoy a sumptuous Christmas Eve buffet dinner at Sands Restaurant featuring international cuisine and special holiday-themed desserts. On 25 December at 7pm, savor a delectable buffet spread on Christmas Day featuring traditional homegrown favorites such as Christmas Hardinera Meatloaf, Adobo Stuffed Lechon Manok and Ham Leg Lechon Crackling. Rate is set at PHP 1,250++ per adult for both holiday feasts. Experience the best holiday pampering at Terra Wellness Spa with the gift of relaxation. Unwind with Terra's Holiday Bliss for 60 minutes. Rate is at PHP 2,450++ for two. Rejuvenate with Terra for Two, a combination of Terra's signature massage and salt scrub. Rate is 15% OFF the regular rate of PHP 8,200++. Both offers are valid from 1 December to 31 December 2016. To book the offers, please go to Discovery Shores Boracay Celebrates Christmas 2016. 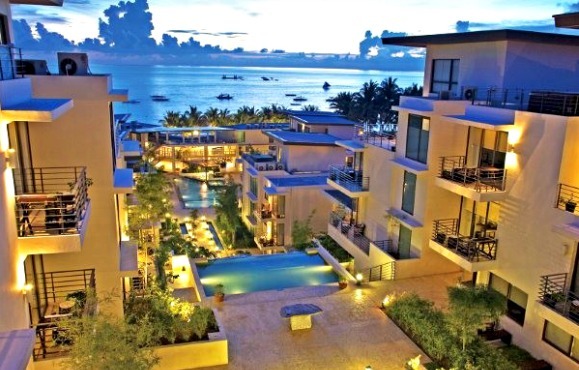 Discovery Shores Boracay is an award-winning 87-suite luxury resort in Station 1 of Boracay's famous White Beach. The beachfront property features the highly-acclaimed Terra Wellness Spa and well-loved restaurants Sands and Indigo. The resort is consistently listed in Travel + Leisure Magazine's World's Best Hotels and is a constant awardee on TripAdvisor. Discovery Shores Boracay is one of five properties of The Discovery Leisure Company's portfolio of distinctive hotels and resorts, and is a member of Preferred Hotels and Resorts Lifestyle Collection. Get updates through Discovery Shores Boracay's official website at http://discoveryshoresboracay.com.